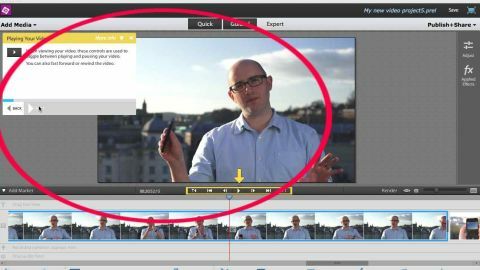 Is the latest version of Adobe's consumer-level video editing application worth £63.49? The Guided section offers an excellent way for people new to video editing to familiarise themselves with the concepts of the craft, and how it all works within Premiere Elements' way of doing things. There are also plenty of features designed to simplify complex tasks, such as colour correction or complex special effects. Adobe should be commended for striving to make these functions of post-production much easier to get to grips with, even for those who have little to no experience. Premiere Elements' Guided section helps newcomers to understand the interface and the procedures needed to create a film. Being able to transfer photos and videos from your phone to your computer via the cloud - or more specifically Adobe Revel - is also a boon. It's a shame, though, that you can't mark which parts of your clips you'd like to use until they reach your computer. Because Adobe insists on creating its own interface, distinctive from the usual Mac or Windows look, some aspects can and do go wrong. In Mac OS X 10.8's default settings for instance, scrolling from right to left moves the elements on the screen from right to left - just as it does on an iPad. But in Premiere Elements, scrolling right to left moves the elements left to right as it used to be in versions of the OS prior to 10.7 (Lion). This can get frustratingly confusing over time - and seems totally unnecessary. As mentioned above, our experience of Premiere Elements 12 was also characterised by the programme crashing with disappointing frequency. There are undoubtedly some strong features in this update - do they warrant paying all over again for the latest version? Ultimately it depends whether you're a lover of special effects or not. If you are, you'll most likely appreciate the subtle improvements and new features that come with Adobe Premiere Elements 12. If not, then there's little to make the upgrade worthwhile, especially since the app crashed a lot during testing. Fingers crossed Adobe will be fixing this sooner rather than later.